Tamela Mann's hair and makeup for the 2013 Dove Awards was pretty as usually. Tamela Mann All Dolled Up For The 2013 Dove Awards. Alright now Mrs. Mann...You better work it on out! Earlier this year she stepped out at the 2013 BET Awards and her hair and makeup was just as flawless for the 2013 Dove Awards as it was the BET Awards. It looks like she still keeps the same glam squad which is makeup artist Riska Crowder and hairstylist Karla Lang. Her leading man David Mann accompanied her to the award, but also was a presenter during the award show. Tamela Mann along with worship artist Chris Tomlin received awards at the 44th annual Dove Awards show for multiple nominations including the artist of the year category. During Tamela Mann's acceptance speech she stated I give praise and thanks to the Lord - what a blessing! I'm thankful to everyone for their support of my music. I'm honor to be recognized by the GMA and I want to give all of the glory to Him. Tamela Mann performed a compelling medley of Take Me To The King with her new single, I can Only Imagine, backed by her band during the show. Her soaring vocals and passionate delivery brought the captivated audience to their feet, joining her in worship. 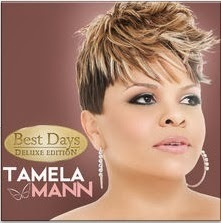 On October 29, 2013 Tamela Mann will be releasing the deluxe version of her album Best Days. The album was recorded on her independent label Tillymann Music Group and Central South Distribution. Her first album entitled Best Days was released in 2012. The deluxe version features five new recordings including three live versions of Best Days hits and two new songs. Other songs that will be on the album are Guest of Honor, Best Days, Take Me To The King with the medley of I Surrender All, and an updated version of the classic Kirk Franklin Tamela Mann's collaboration Now Behold The Lamb, and newly released single I can Only Imagine.